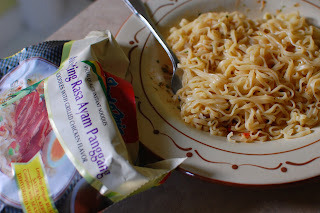 Indomie Mi Goreng noodles are indisputably delicious, and are offered at a ridiculously low price point. It surprises me why anyone would donate an Oxfam goat to a needy family, when you could feed a family with delicious Indonesian noodles for months for the same cost. Decadent westerner that I am, I upgraded to the Premium Indomie line (20c more!). They're wonderful. Gotta love top ramen lol. touche. i live in a dorm and have pretty much been living off mi goreng and muesli all year!